When machines In your laundromat are out of order, they can drag down much more than your revenues. Out of Order Machines – What’s the Real Cost? How much revenue would you lose if you had a washer or dryer go down on a Friday night? The machine will most likely be out of service through much of the weekend, the busiest times for laundromats. Take it a step further. How much revenue would you lose if you had 3 or 4 machines that were out of service? 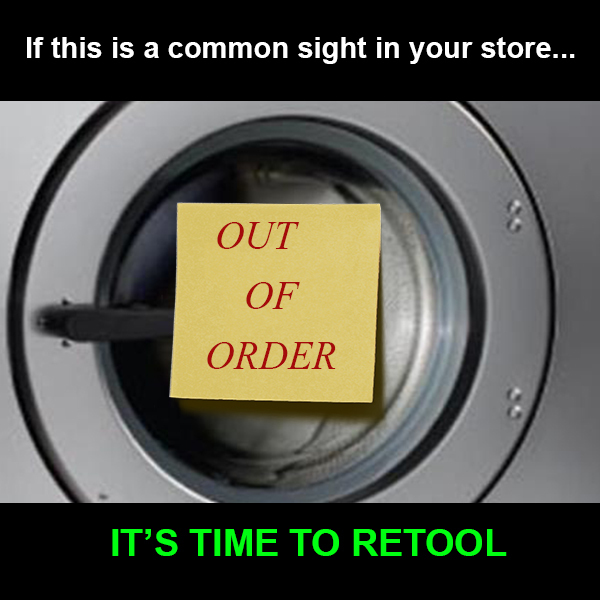 If out of service machines are commonplace in your store, you may be losing much more than revenues on a weekend. The value of your entire laundromat may be at risk. Then there is customer frustration at the experience of encountering machines that are out of service and being unable to find a free washer or dryer during the busy periods. You’ll probably lose some customers to competitive stores nearby. That’s even more revenue lost. Attempting to win back customers who have gone elsewhere can be an expensive proposition. Let’s talk expenses. Every time you call for service, how much does that cost you? It gets even more expensive if you do not have a service contract. By the way, the broken down machines were likely to be running inefficiently before they broke. How much more did you pay in utilities because of the inefficient machines? There are owners who view replacing old machines as expensive. On the contrary, keeping the old machines can be more expensive and detrimental to their business. If you have washers and dryers in your laundromat that are frequently out of order, it may be time to retool with new machines. Consider a typical 1,500 square foot laundromat with 12 year old equipment consisting of 25 washers and 26 dryers retooled with new equipment. The new efficient, high G-force machines can provide tremendous savings in utility costs because they use less water, gas and electricity. The repair bills go down as well because the new machines are unlikely to need frequent repair, if any at all. If the new equipment includes some larger capacity machines, 80-pound washers and 100-pound dryers, for example, customers may be willing to pay more to use those machines. The bottom line is revenues go up and expenses go down. Replacing all the washers and dryers in this scenario – not just out of order machines – may cost around a between $250,000 and $400,000 depending on the equipment mix and other factors. The question of how to pay for the new machines and how that will affect profitability comes into play. Financing is always an option and there are financing companies that will finance the purchase of new equipment for an existing laundromat with terms up to 10 years. In other words, there are many laundromat financing options. A laundromat with older machines may get valued at about 3 times revenue. A store with newer machines is likely to be valued at up to 5 times revenue. (Of course, this may vary from region to region throughout the country.) In addition to increased profit, the store can sell for much more. That’s the real win. Beyond your store getting new machines, your get to renew your energy by not being burdened down with many call about machines being out of order. Consider discussing your options with your equipment vendor.